Cool Hand Burg: On The Jazz . 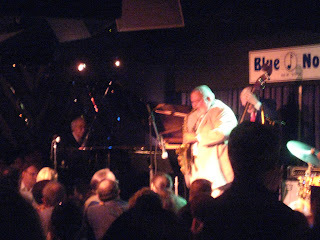 . .
We went to Blue Note on Friday to see the "Living Legend"* Dave Brubreck perform. Sure he's old, but still amazing. This is no exaggeration, those old guys played some pretty serious music. Mrs. Burg had to restrain herself from shouting and clapping every ten seconds.